But now Muslim Americans are “here” in a whole new way as a record number won their elections on Nov. 6. And ironically many of these candidates were inspired to run in response to the most openly anti-Muslim president our nation has ever seen, Donald Trump. 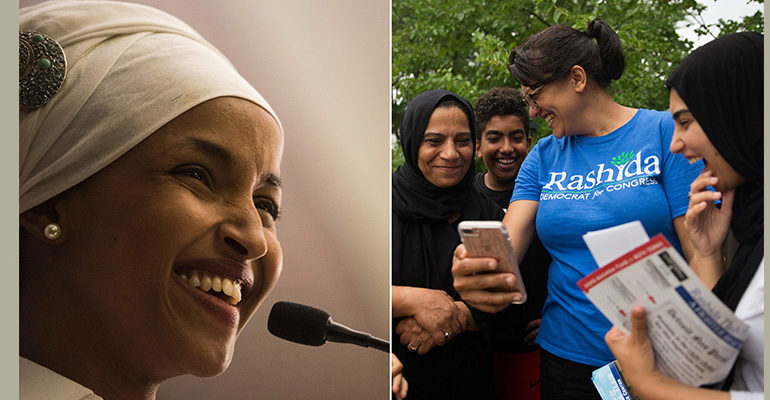 Other big winners among Muslim candidates included Keith Ellison, who became the first Muslim ever to win statewide office with his victory in the race to become Minnesota’s attorney general. In North Carolina, we saw the first Muslim American ever elected to the State Senate with the victory of 32-year-old lawyer Mujtaba Mohammed, who is Indian American. And there were also numerous other Muslim Americans winning elections in local races, including five Muslim American women who were elected in California’s Bay Area, from City Council to Board of Education. As the Council on American Islamic Relations noted, all told a record 55 Muslims won election, from federal to local offices. These record victories aren’t all that shocking, really, given that in 2018 we saw the most Muslim Americans ever to seek office. To give you some context, in the 2016 election cycle, only about 12 Muslims ran for office. Flash forward to the 2018 and there were more than 100 Muslims seeking office, many specifically stating they were doing so in response to Trump’s anti-Muslim hate. But here’s the thing: Muslims running for office and winning is not just great for the Muslim American community — it’s also great for our country. Since Trump began demonizing the Muslim community for political gain, from his Muslim ban to declaring that “Islam hates us” through November of last year when Trump retweeted vile anti-Muslim videos, the Muslim American community has seen a spike in hate incidents directed at us. In 2016, assaults on Muslims jumped to levels not seen since in the aftermath of 9/11. And since then we have continued to see a rash of anti-Muslim events, from threats to attacks on our places of worship, to even a terrorist plot by self-professed Trump supporters to kill Muslims in Kansas. But what has received less coverage but is possibly even more heartbreaking is the impact Trump’s anti-Muslim bigotry has had on younger Muslims. Last year a study published by the Institute for Social Policy and Understanding found that 42 percent of American Muslims with children in K-12 reported their children had been bullied for their religious beliefs. In California, that number was closer to 50 percent. And just a few days ago, a 10 year-old Muslim girl in Framingham, Massachusetts, had two notes directed to her that read “you are a terrorist” and “I will kill you”, causing the youngster to become visibly shaken and break into tears. Was there bullying before Trump? Of course, but anti-Muslim bullying has risen under Trump and it’s not surprising, given that children hear the president demonizing Muslims, so why wouldn’t they think it’s OK to follow his lead? The result is these young Muslims are growing up in a country where they truly feel like they don’t belong simply for their religious faith. As well-known Imam Omar Suleiman recently noted, the harmful effects of anti-Muslim bigotry on young Muslims “leaves them unsure about both their national and religious identities.” These younger people feel that “the only way to excel is to relinquish their Muslim identity or at least obscure it from the public,” he added. The Nov. 6 political wins by Muslim Americans can play a role in changing all that for the better. The Muslim electoral victories make it clear that increasingly, voters are seeing Muslims not as a threat but as fellow Americans. On some level it’s the story of America, where groups are demonized as outsiders but over time are able to become seen as part of the fabric of our nation; and serving as elected officials has played a role in doing just that. By Dean Obeidallah, a former lawyer turned political comedian and writer, is the host of The Dean Obeidallah show on SiriusXM radio. He co-directed the comedy documentary “The Muslims Are Coming”! His blog is The Dean’s Report. This story was first published by the Daily Beast. Next article Iran sticking to nuclear deal, rules out renegotiation with U.S.